The secret is to believe in your dreams; in your potential that you can be like your star, keep searching, keep believing and don’t lose faith in yourself. Offered for players U7–U19. Managed by a professional coaching staff, our Academy is geared towards the complete development of high level players looking to progress to the collegiate level and beyond. We are committed to the long term development of players in our system. We believe that players develop at various stages and we encourage a healthy attitude towards growing as a player and person. 'I am DUSC' is a set of values that we aim to instill in our players throughout their journey. Our coaches and staff bring many years of experience and various cultures to our organization. Using best practices from across the world, we have molded our approach to teaching into what we call the 'DUSC Way'. This approach is unique to our environment in NYC and our culture as a club. Very young players from this age age love to play. Therefore, practices are based on fun games. Players spend the maximum time possible in contact with the ball and experiment by themselves. Players have to build a relationship with other players for the first time. Players are given different responsibilities in order to develop a sense of team. Basic motor skills like walking, running or jumping are combined with ball handling and ball control. Pre-pubescent players from these ages have a special ability to learn. Therefore, this is the right age to work on specific soccer techniques and skills. Developing good technique is essential at this age. Small-sided games are used to develop basic attacking and defensive principles. Other important aspects of tactical training are possession, combination play, transition and finishing in the final third, as well as zonal defending. Players will rotate in two or three different positions to avoid early specialization. Speed, coordination, balance and agility are the main physical aspects to improve at this stage. Teams will compete in leagues with no scores or standings. Our emphasis is on players improving, not winning games at this stage. At this stage, training sessions are oriented more toward tactics. Players must also practice all different types of techniques at this stage. Strength and endurance are an important part of the fitness training. Coaching methods consider and preserve players’ health since they will be experiencing many changes due to puberty at this stage. Warm-ups and cool downs are essential, as is dynamic flexibility. Tactical training and small-sided games are an essential part of the training at this stage. Attacking and defending principles must be part of all games. Important aspects of the tactical training are speed of play, quick transition, counter attacking and finishing in the final third, as well as pressing. Technique will focus on speed and accuracy. Passing and finishing are two of the main techniques emphasized at this stage. Part of the technical training will be position-specific (e.g. defender: passing, center midfield players: receiving to turn and strikers: finishing). The physical aspect of the game is key at this stage: endurance, strength and speed will be part of the weekly training routine. Players should be expected to show commitment to the team, concentration in training sessions and competitiveness during the game. How is the selection process handled? How will I be contacted on whether or not my child was selected? What are fees and what do they cover? How often do players practice? What is the game format on the weekends? When are practice schedules released? All players will be given an identification number at tryouts for evaluation purposes. Coaches and staff will evaluate all players and make selections based on ability and specific team needs. Coaches and staff will review evaluations collectively following the final tryout and make determinations on team selection. Players that have been selected for an additional tryout will be contacted via email to coordinate a second tryout date during a team training session. Those who do not make the program will receive an email that includes alternate soccer opportunities at DUSC where your child can improve his or her skills in an appropriate environment. Club dues Club dues vary by age and range based on age. We have not finalized club fees as of yet, however 2017-2018 were between $2100-$2800. Club dues cover a variety of program costs including but not limited to: professional coaching fees, referee fees, tournament registration fees, office/admin staff and administrative fees, equipment costs, field/gym rental space where applicable, other. Club dues do not cover uniform fees. Uniform kit The uniform kit is purchased on a two year cycle. 2017-2018 was the start of a new cycle and ALL players are required to purchase new kits which include: Adidas home and away jersey, Adidas shorts and socks, two practice Adidas shirts, one practice Adidas shorts, Adidas sweat suit and Adidas back pack. DUSC is an inclusive community and offers financial assistance for players identified that show talent, commitment, and have need. For more information on our scholarship program, click here. Academy players train two-three days during the week in the fall and spring season and two days during the weekin the winter. Unfortunately practice days and times vary and are dependent on park permits. We will not have official times for practices until approximately one month prior to the season beginning. Unfortunately we cannot guarantee that the day of the week will be the same from season to season due to permit availability. We participate in a number of different leagues dependent on the age and level. CJSL is our local boys’ league. WYSL is our local girls’ league. 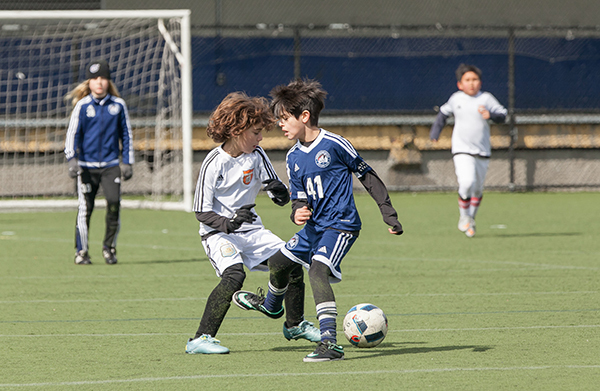 Our top teams play in regional league competition throughout NY, NJ and CT in EDP. Game locations and times vary and may be played on Saturday and/or Sundays. Teams will enter various tournaments throughout the year with a schedule released prior to the season. 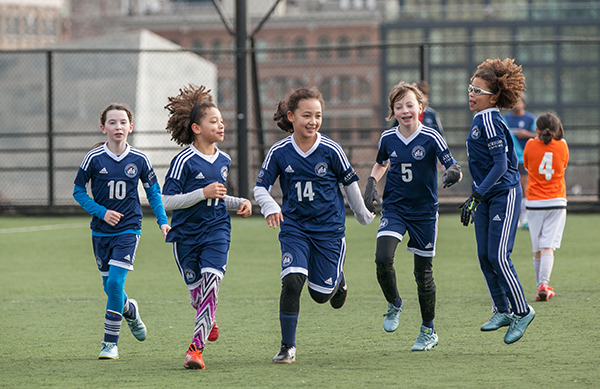 For the outdoor season, we have permit space at Pier 40, JJ Walker, Chelsea Waterside, Chelsea Park, Roosevelt Island, Randalls Island, Brooklyn Bridge Park among other locations for practice during the fall and spring. Games can vary due to method of competition on the weekends. Practice space in the winter months vary due to field permits and gym rentals and are throughout Manhattan, Brooklyn and other parts of nyc. The academy program is essentially a ten month commitment from the last week in August through the second week of June. The year is broken up into three seasons, fall, winter and spring. All players are required to attend all practices and games throughout the year. We understand that there may be conflicts at times and ask that coaches be notified in advance with a reason why the child will be missing. A high percentage of attendance must be kept; otherwise players are in jeopardy of losing their spot. There is a waitlist for players in each of the academy age groups and we believe it is important for the development of the player to attend all stated programs. Unfortunately, we do not own our fields and we are at the mercy of the various permitting bodies and schools that from which we rent facilities to release their final permits. We have a good idea of usage based on historic usage, but there are various tweaks which change our structure. Each season will probably be different in terms of the day(s) of the week and times for training for each respective team. We have different permits/rentals each season and have to try and accommodate the many teams we have within the club. Typically, Fall schedules will be released in July, Winter schedules are released in early December, and Spring schedules are released in February. Fields and gym space are one of the biggest challenges we face living in NYC.